You are what you eat. “Taking vitamins is a great way to help make your hair fuller and grow faster. But while you’re patiently waiting, a change in your diet can make a huge difference and even help expedite the process,” explains Carla Rivas, hairstylist and co-founder of the all-natural hair growth vitamins Hair La Vie. 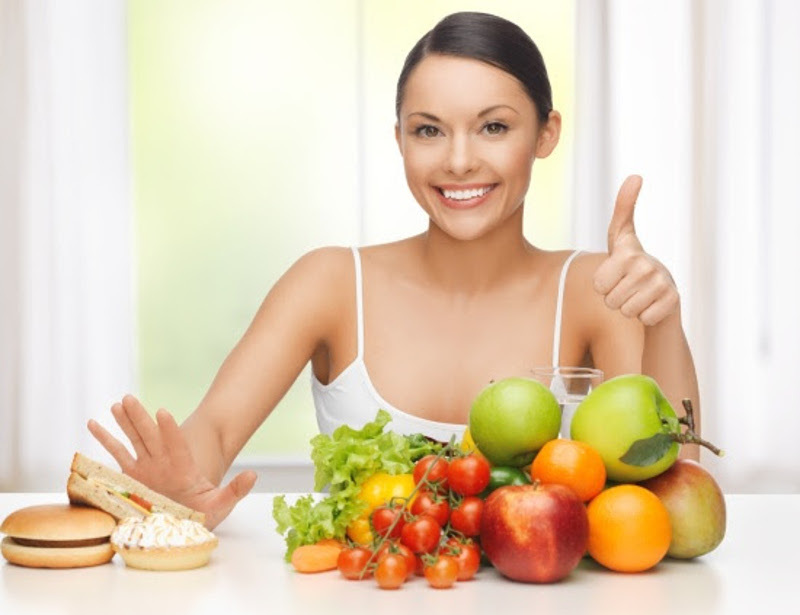 Here are the top foods to enjoy and stay away from in order to maintain a healthy hair diet. Sugary foods like your favorite candies or cupcakes cause your insulin level to rise, which also causes an increase in androgen (a male hormone) in your body. This hormone is known for causing hair follicles to shrink and become irritated. This leads to hair thinning and hair loss. The grease from fatty meats like fried chicken and french fries can cause more secretion on the scalp. Also, a lot of the time after eating greasy foods, people touch their face and hair without washing their hands. This causes both acne and damage to the hair. You need a clean, debris-free scalp or your hair will not grow healthy and your follicle could be damaged. Think chips and canned/frozen meals. Consuming a lot of salty meals and snacks will dry your hair out and leave it weak, lifeless, and breaking. Starches like pasta and a lot of cereals, which can be low in protein, will leave your hair limp and unhealthy. That bounce and shine most ladies want is not possible without a healthy dose of protein. People should be eating nutrient and antioxidant rich foods, like fruits and vegetables, if they want to grow long, healthy hair — and a strong, healthy body. These foods help hydrate your scalp and strengthen your hair. Eggs contain the healthy doses of protein, zinc, and iron that your hair and body need. Zinc benefits for hair include promotion of cell reproduction, tissue growth, and repair of broken tissues. It also maintains the oil-secreting glands that are attached to your hair follicles, thus decreasing their chances of falling out. Tomatoes have antioxidants that aid in scalp circulation. A healthy scalp leads to happy hair. Add them to a salad or mix them into your favorite dish for a pop of color and tons of fresh flavor. Greek yogurt is an amazing source of protein, vitamin B5, and vitamin D. Pantothenic acid (vitamin B5) is great for keeping the scalp clean and free from film and debris. This keeps the follicles from becoming irritated and promotes healthy, strong hair growth. Add fruit, nuts, and granola for an energizing midday snack. Your hair is made of protein, so it only makes sense that your hair will benefit from opting for healthy lean protein sources like grilled chicken or baked salmon. If your diet lacks protein, your body will begin rationing the protein left, which will lead to hair loss. Protein also has the iron you need for healthier, beautiful hair. Glad to know that eating Greek Yogurt isn’t just good for the digestive system. Makes me want to eat more, along with my lean protein and eggs. WOW I never really thought about this! My hair is not bad, but a little on the thin side. I am going to have to try these and see if it helps. I had no idea that Greek yogurt had those benefits. I may have to start picking up some more tomatoes too. I take vitamins and minerals everyday and am trying to do my best to clean up my diet for health reasons so fingers crossed it helps my hair, too! My hair never wants to grow long and if it does start getting on the longer side, it looks terrible. I’m hoping some of these tips will help! These are great tips for healthy hair!! I will definitely be taking these into consideration since I am trying to grow my hair out again!! These are great. I love veggies so this diet is going to be something I’ll enjoy. I had no idea sweet treats can affect your hair’s health, that’s new info for me. Thanks for the list! I also didn’t know sweets could affect your hair. I LOVE sweets and still have a thick head of hair with no loss (except after my pregnancies which is normal). Wow, thanks for this great info. I will increase my tomato consumption as soon as possible. Great tips! Thank you so much for sharing this! I’ve never thought about how diet can affect my hair, but since hair is made of the same cells as skin, it only make sense. My hair is one of my first health indicators. It’s normally very shiny. I can tell right away if I haven’t been eating right. This reallly is a great illustration of ‘you are what you eat. Your hair (and your skin!) really do reflect what you’re eating regularly. You are what you eat. I totally agree especially with my current diet/meal plan. It makes a difference in your hair and skin. My hair could really benefit from a good all-natural hair growth vitamin supplement. I need to eat better as well. Sometimes when I’m on the go, I grab for the sweets instead of the healthy. I didn’t know sweet and salty food affects hair health as well. maybe that’s the reason why I’m have such an unhealthy hair.